Thank Dog!® Bootcamp is a one stop fitness program that combines a strenuous workout with basic obedience for both dogs and their people. 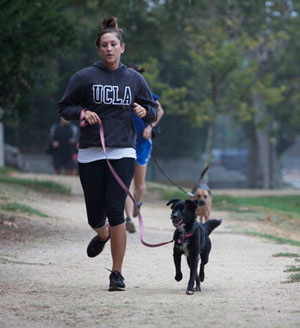 The class is run by one personal trainer and one physically-fit dog trainer. Everyone is considered a team; therefore, the class will never be divided into levels. Whether it’s the actual workout or basic obedience, the Thank Dog!® team will always be available to personally help and guide each pair as they need it. Both dogs and owners alike are required to attend a consultation and obedience lesson before entering the program. This is to ensure that dogs are familiar with their basic commands so the workout will go smoothly (owners will be given written homework to maintain training outside of bootcamp). Dogs will also be evaluated for temperament to prevent HUMAN aggression within the class, but we will take even the most unruly doggies! Owners will be interviewed, weighed and measured (optional) to ensure a healthy start while also discussing future goals. A welcome folder will be given at this time as well as equipment lists. However, individuals must provide their own weights, dog training materials and water. Treats are optional. Thank Dog!® will provide everything else needed for different workouts. Each class will be 1 hour long and will be comprised of cardiovascular training, obedience training and strength training. Dogs will be on-leash throughout the entire class and they will be taught “go to your place” while owners are strength training. Thank Dog Training and Thank Dog Bootcamp. All rights reserved.